I was planning to run an ad in this week’s Manly Daily entitled “Are You Special?” (yes, that was actually after a lot of thought)! Things have been a little crazy at the hive (it seems that word has been spreading) and that, combined with the fact that I have torn wing (rotator cuff) means I really need some help. 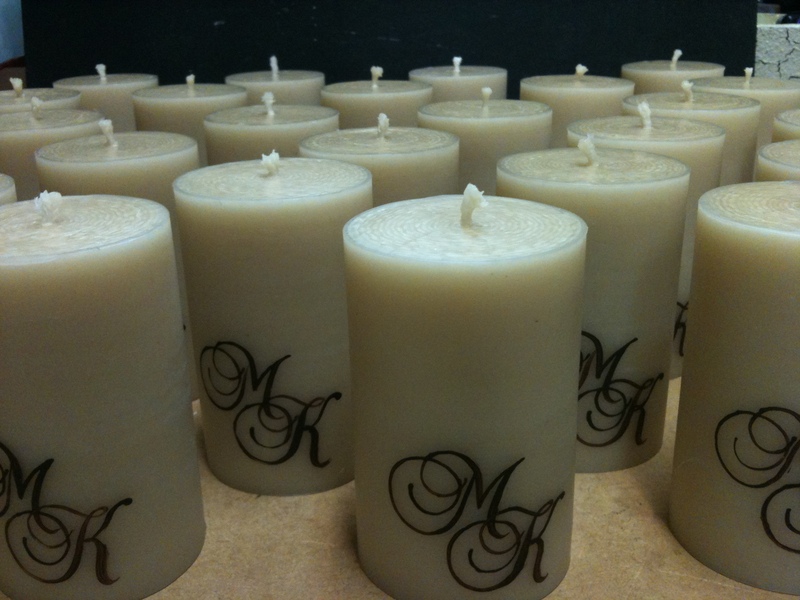 There are two positions actually, one for a candle-maker, and one for a Woman Friday/Admin Assistant Extraordinaire. I am looking for someone 3 – 5 days per week (depending on the person, hours, availability etc), with a requirement to work at least one Saturday a month (so that I too can have an occasional go at a normal life)! If you think you may be the special bee we’re looking for to join Queen B, please pop me an email with your resume and a cover note including: 5 things we should know about you; what you’d like to do with your life; and a little about the job you’ve liked most in your life so far. (yes, the same as our other ad and generally far more useful than a resume). 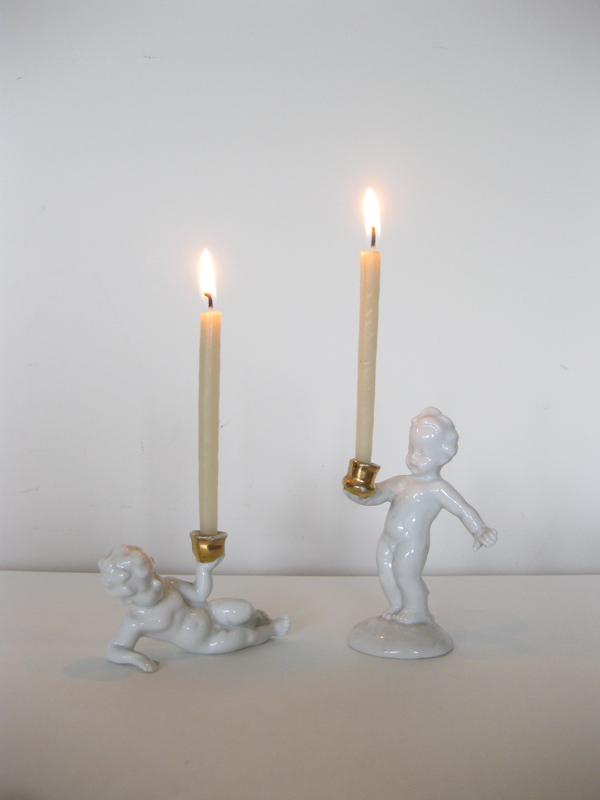 Why the cherubs?… because I need an angel! 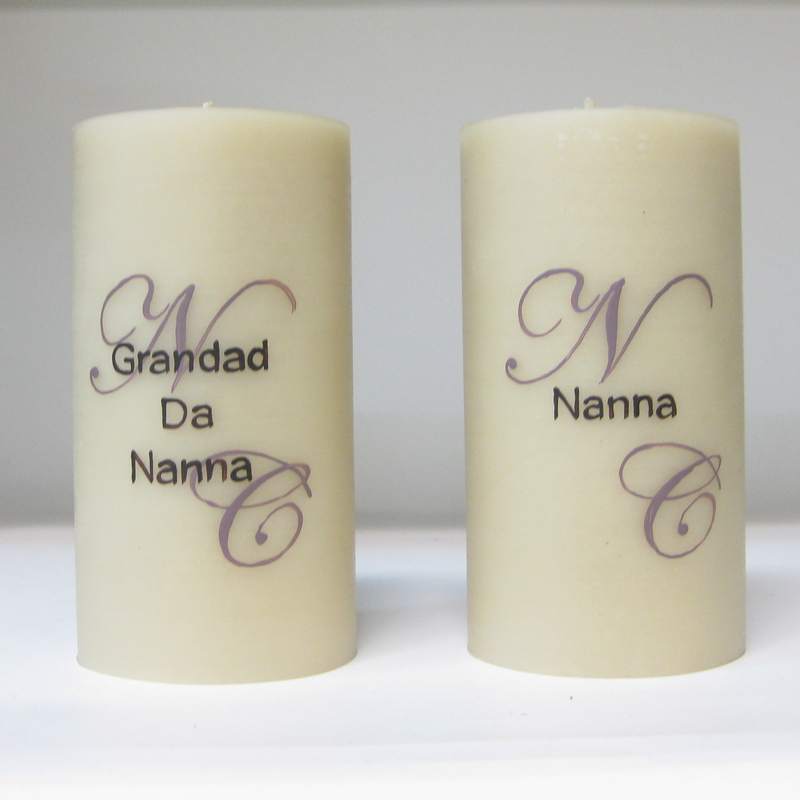 We did these candles with the intials of the bride and groom which were to be used as decoration, lighting and as gifts for guests to take. 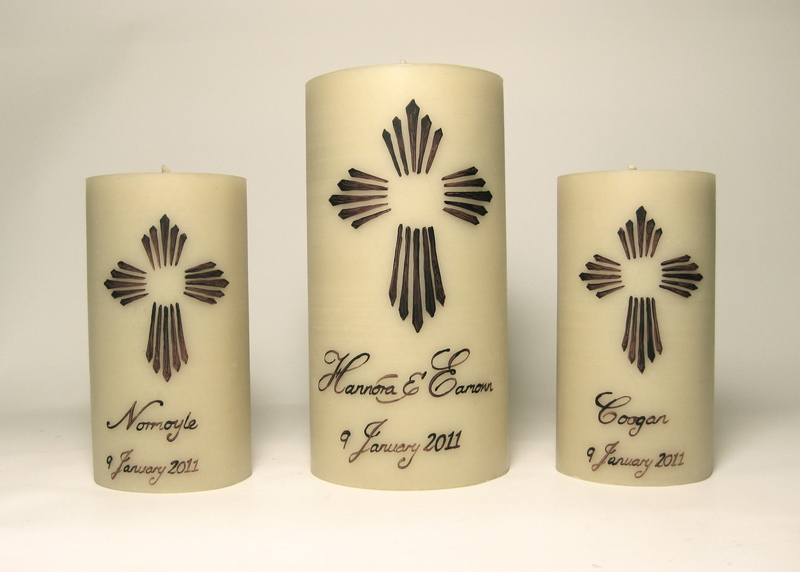 Another take on unity candles (and as you can see, one VERY organised bride)! 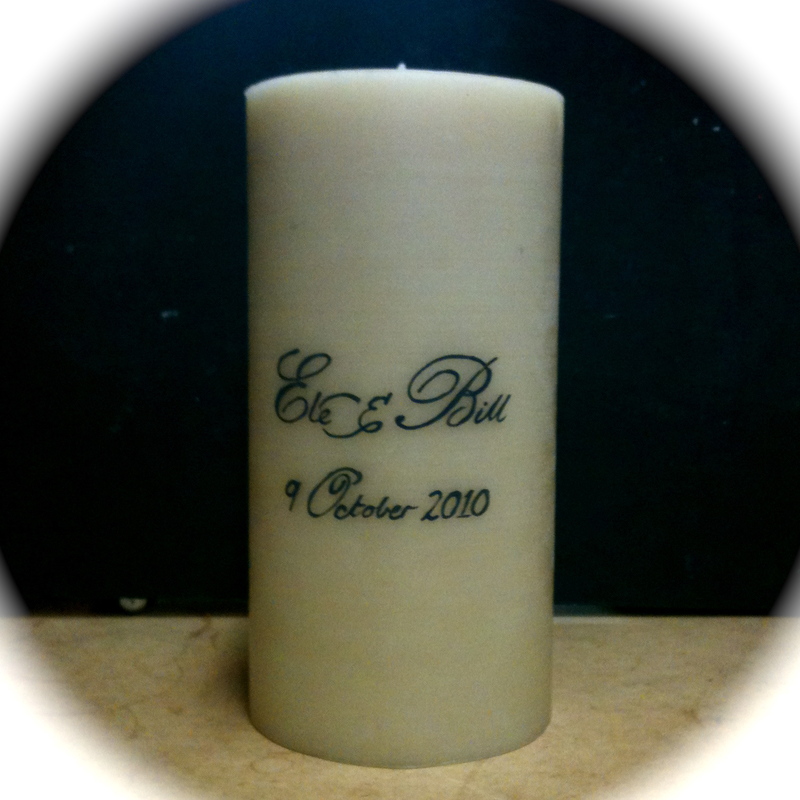 This one is being used as the Paschal candle for an upcoming wedding. These were painted so that loved ones who had passed would still be there to share the day in light and spirit. That’s just a few of the one’s from the past few weeks. 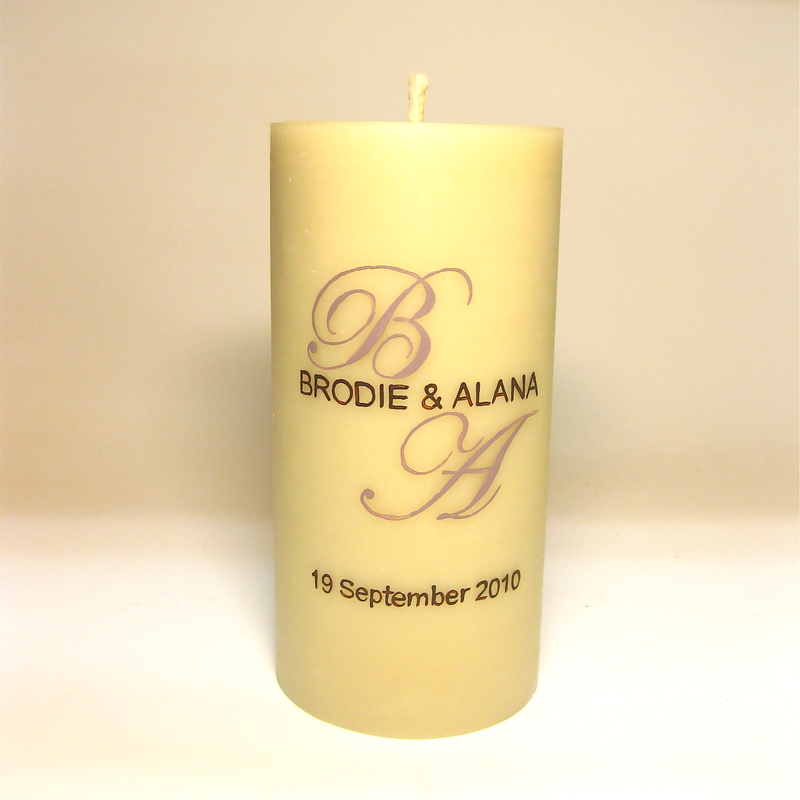 If you’ve used Queen B candles to light up your wedding, send us a note or a photograph or share your thoughts. Do you/your company do Christmas gifts that stand out? OK, so not exactly a catchy title! Believe me, I’ve tried 10 prior to this one that were worse. While it may seem a little commercially crass to be talking about Christmas now, most companies are making a decision on what they are doing for client gifts, staff gifts or corporate hampers now… and we would like to be in the mix. What do your corporate gifts say about your company and it’s values? Do they value health/life balance? The environment? Regional communities? Australian made? Perhaps most importantly, is it memorable? Does it cut through? Does it have longevity? 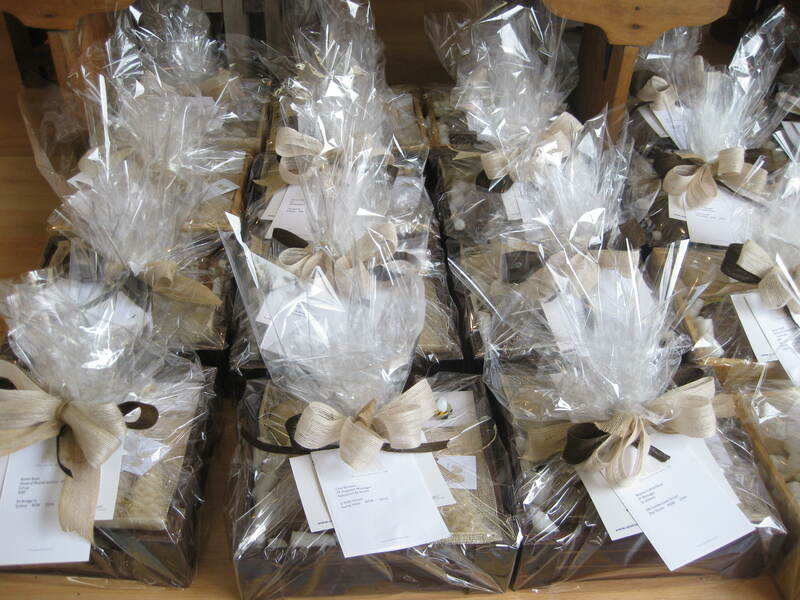 I LOVED doing our hampers last year, because I was just so thrilled on behalf of our clients that they were offering something different to another jar of olive tapenade! Another bottle of wine! 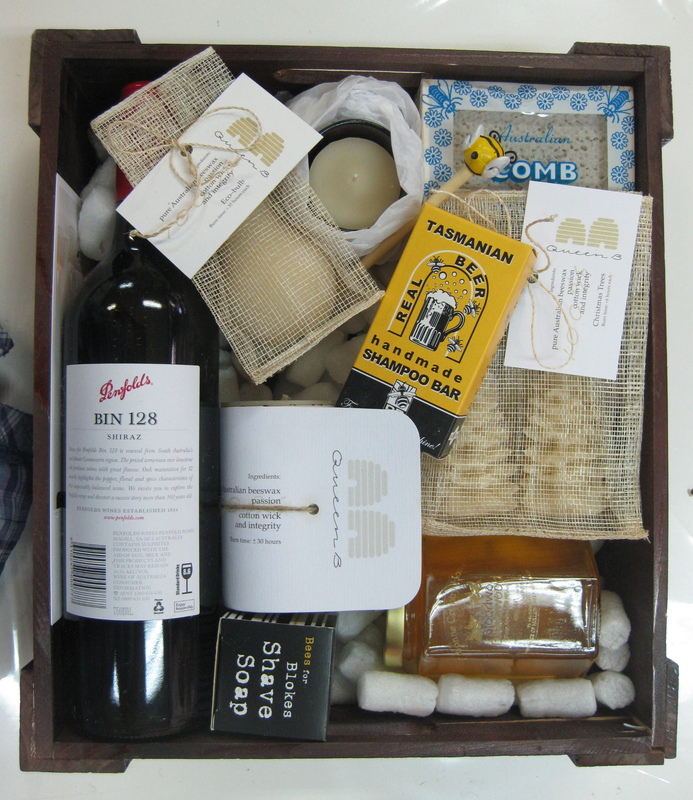 Our most popular hamper on behalf of our clients last year was sent to men (CTO’s, CEO’s, COO’s) and included a rolled pillar (in the Phoenix design), a black votive, a jar of Australian honey, a pair of the small Christmas trees, a box of chocolate coated honeycomb, a Tasmanian wood-turned honey dipper, a chunk of pure Australian honeycomb (straight out of the hive), a block of all natural men’s shave soap, a Tasmanian beer shampoo bar and a Queen B eco-bulb… oh, and a bottle of wine provided by our client! 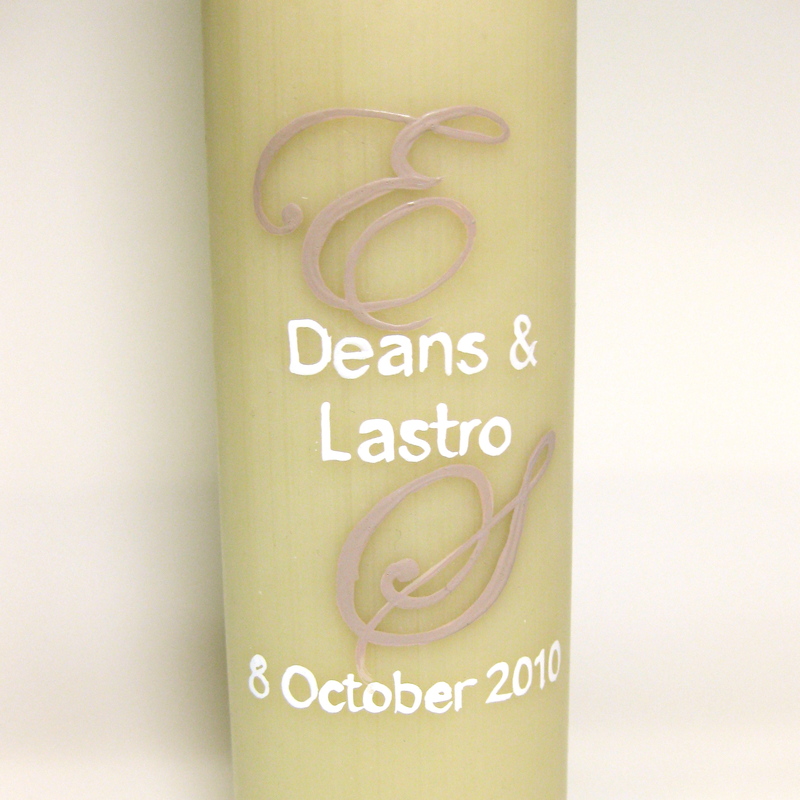 We also had a similar version that went to their female clients substituting the Casablanca design for Phoenix, a frosted votive and a bottle of divine Honey Cream bath. 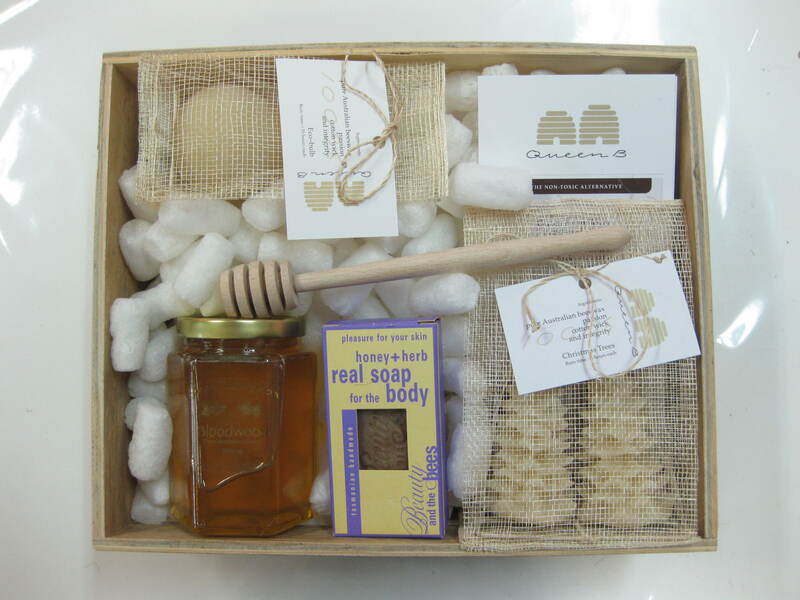 We also did a smaller hamper that packed a punch too with Christmas trees, an eco-bulb, a jar of Australian honey, a bar of Goats Milk soap and a beautiful honey dipper. The warehouse and office staff at our courier company voted Queen B hampers the best they’d saw last Christmas (and being a courier company, they see them all!) and our clients (without exception) have returned to us this year. Anyway, so this is a bit of an APB. We would LOVE to be working with more companies this year to do gifts that are memorable and that build their brand and that are meaningful and lasting and full of ‘sweetness and light’. If your company does gifts, I would be extremely grateful if you could either pass our details on to them, or pass their details on to me and we’ll get on to it. Feel free to pass this on to friends and family too! You just never know, if you’re lucky, a Queen B hamper or Queen B candle may be winging its way to you this Christmas… now wouldn’t that make your day? or festive season? !